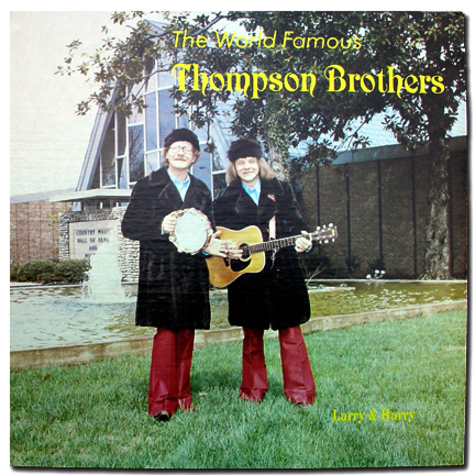 While most musicians who move to Nashville do so in hopes of getting on the Grand Ole Opry, these guys moved to Nashville in hopes of getting on Hee-Haw. Their gimmick was that they wore fur coats year-round. This outrageous bit of incongruence, sadly but surely, worked. That's the old Country Music Hall of Fame behind them. The new one is downtown and really high-tech and fancy, but I still love the old one, especially for its Hee-Haw exhibit which featured a plastic cornfield that looked like it had been made by local fifth graders. I don't think the new Hall of Fame has a Hee-Haw exhibit, but they do have Billy Ray Cyrus' Bum Equipment workout tank top. Now, that's what I call country. Well, that and a guy in a fur coat playing the tambourine.